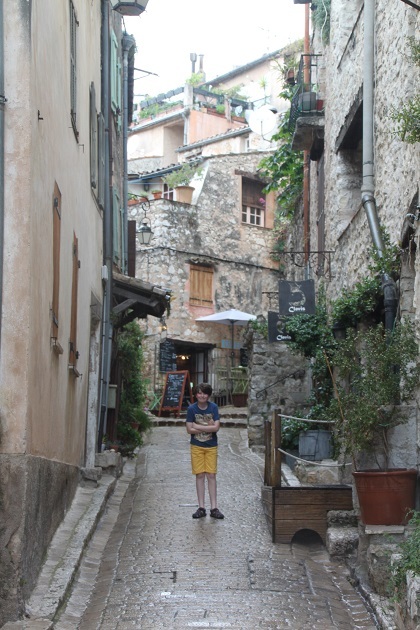 Our final stop on the Gorges du Loup explorations and it was definitely a case of saving the best for last – Tourettes sur Loup. 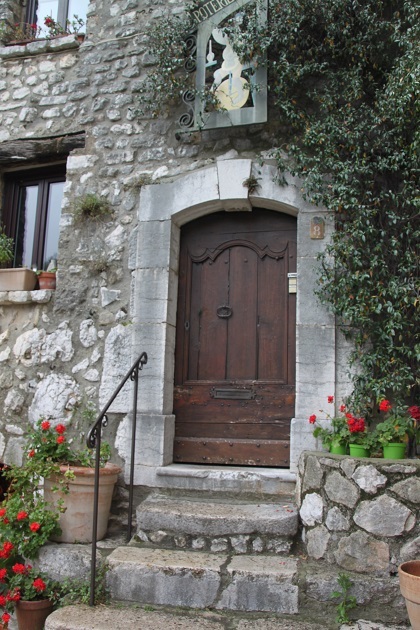 Such a gorgeous little place, perched 1,300 feet up with sheer drops all around it is stunning even as you approach and we all were completely in agreement that the medieval town was a delight. We parked and set off to explore, the only problem was it started to pour with rain as soon as we climbed out of the car – that was not on my agenda. No waterproof coats – this is the South of France I thought – big mistake. The rain was icy and chilly but we persevered. 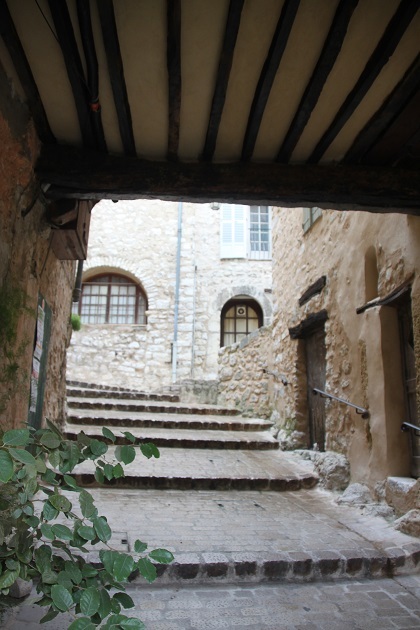 We passed through an alleyway and narrow entrance into the old town and found a medieval maze of narrow, winding and cobbled streets. 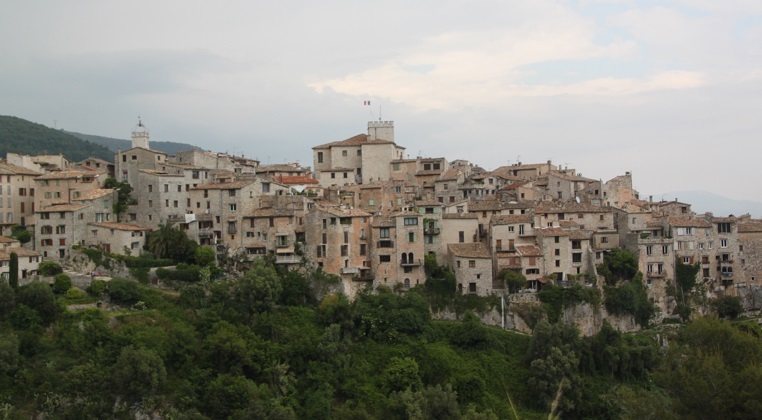 Unlike most of the other perched villages it seemed devoid of tourists too. Maybe this was due to the weather but whatever it was a refreshing surprise, it felt like we had this little gem all to ourselves. A completely different experience to somewhere like Eze. 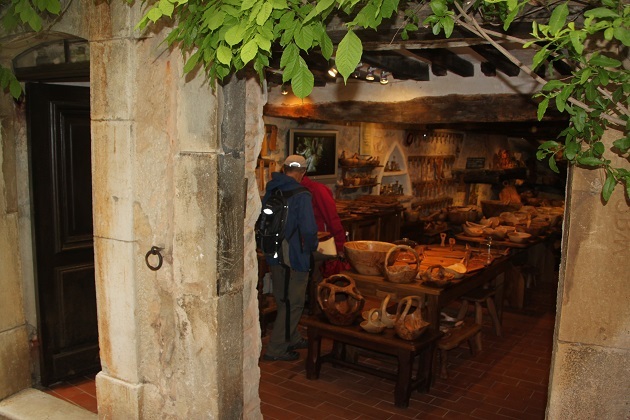 We discovered a 14th century church and a host of craftsmen and women with shops in the old town. Loads to see and do, we enjoyed watching them working with Son’s favourites being the potter, woodworker and a weaver. When the rain got a bit too much, as if by magic Son discovered a sign for crepes. We followed it and went into the cutest little creperie ever. A tiny stone room with three gingham clad tables it was like something from a fairytale. Son ordered up his usual crepe with chocolate, I thoroughly enjoyed a glass of something sparkly from the region with a dash of violet syrup and Husband slugged back a glass of local cider. All delicious and we toasted our trip to the Gorges du Loup. Looks lovely and it is great that you had the place to yourself. We were lucky with the weather the rest of the time (thankfully) Suzanne just caught out this one time. I think because we were up in the mountains, it still taught me a lesson though, always have the layers in the car!! I love this kind of villages! They lead us into a completely different world where everything is so simple. The atmosphere must have been amazing. It was completely magical Erika, craftsmen and women working away amongst those old cobbled streets like they must have done for centuries. It is a special place. I often try to imagine how people went through their daily lives when those streets were only decades old…. amazing! It looks like you had a wonderful time despite the surprise of cold rain. That place looks absolutely magical. It’s the type of place that appeals to me because of all the details, the layers of streets and buildings, and the idea of turning corners and spotting something new and interesting. It was completely gorgeous and a magical place. 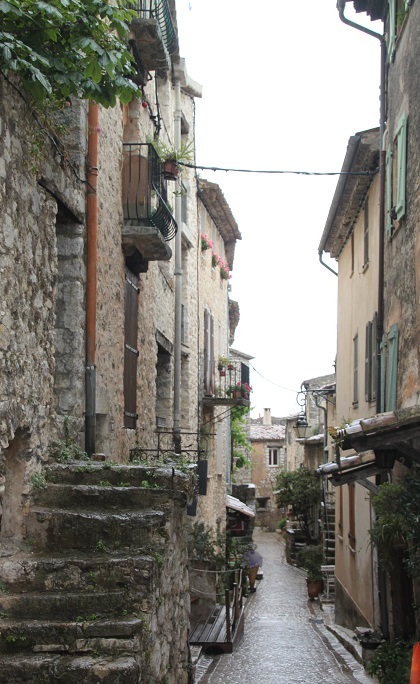 Most of these perched villages in this area are completely over-run by tourists so it is sometimes a bit trickier to see all the detail and take it in. This place was not like that at all and we strolled at leisure (despite the rain) soaking up the beauty and the really special atmosphere. No doubt a relaxing and fun time without the crowds. It’s nice to visit areas away from the beaten path. So true, this was unexpected here too so a lovely surprise to find we had it to ourselves. It is really stunning, it looks like nothing has changed much for years and years – a gorgeous place. 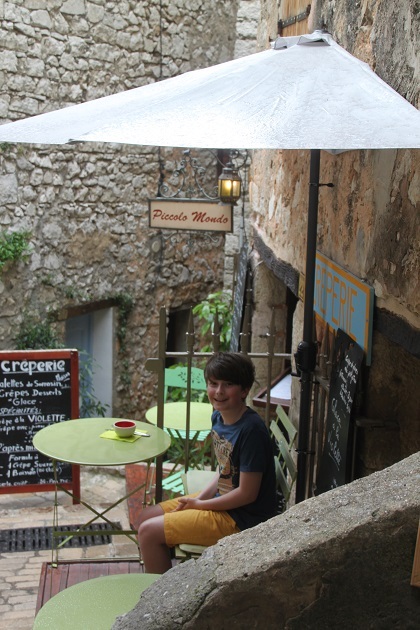 Love these medieval villages perched on cliff tops, there’s always so many interesting corners to explore and who can say no to a crepe! This was a real gem, such a beautiful spot and to have it to ourselves was quite the surprise. 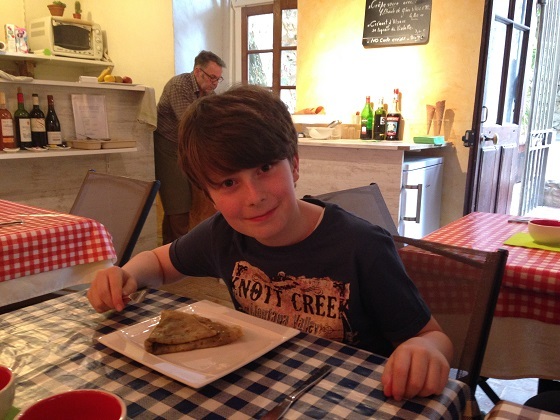 Those crepes…. he can never say no! That’s so true – and the lack of crowds makes all the difference. These chocolate crepes in this place got a very big thumbs up from him Pam, although to be honest I’ve never heard a negative review where chocolate and pancakes are concerned!! 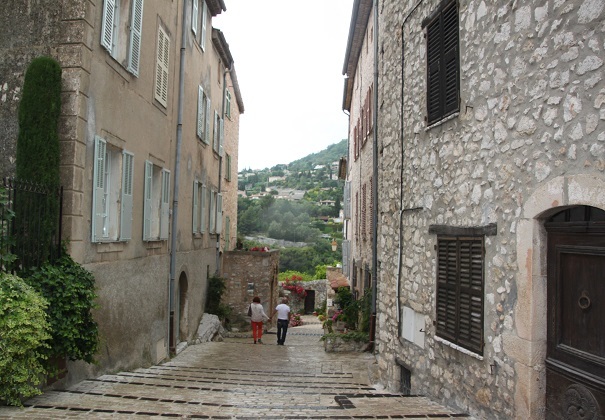 It was a wonderful little village, such a delight to explore and stroll. I didn’t get to try much, from the (tiny) mouthful he allowed me it was pretty good!! We love a city in Croatia called Grisignana, and our last trip there had the same nasty rain factor. Torrential. Still – I wouldn’t change the memories for anything… Magical places and memories don’t mind a little (or a lot of) rain. Thank you, as always, for sharing! There was only a little bit of rain here so apart from slight shivering it was no problem at all! Any excuse to take shelter and grab a crepe…. I hope we can pick your brains about Vancouver chocolate hotspots someday, Canada and Vancouver especially definitely somewhere we yearn to visit and I hope sooner rather than later!! Looking forward to sharing insider chocolate information one day…In the meantime we will continue enjoying traveling along with you! With a dash of violet syrup? Yum! Too bad it was raining but at least you got the town to yourselves – looks lovely:). It was gorgeous, the rain wasn’t so bad and that drink was so good – win win! 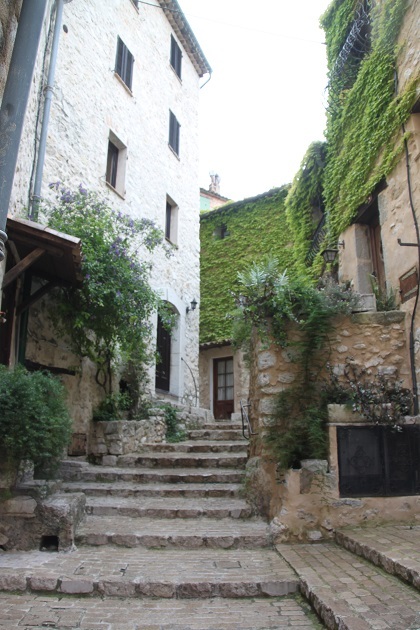 I am always amazed that France has managed to keep these old medieval towns and villages intact where we in UK have failed spectacularly to do so. Great composition in that first picture of the creperie. Absolutely, this sort of place is the norm in that area, we just have failed miserably. 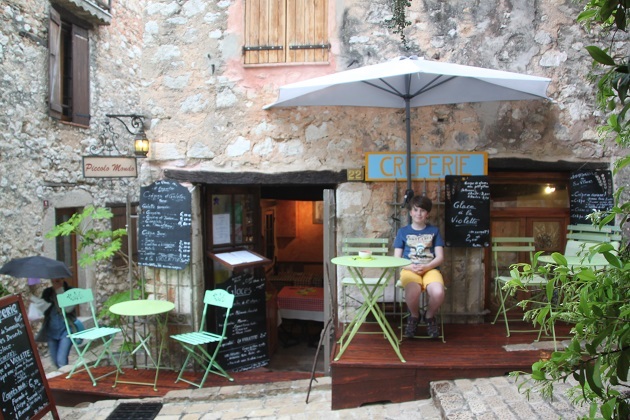 This was a gorgeous little place Mark, the craftsmen working added to an already lovely atmosphere – highly recommend a visit when you’re next in Provence! It’s completely gorgeous, so unspoilt and to see the craftsmen at work as well is a real treat.